"Ladies and gentlemen, it is time to collect the money we're owed by those who find themselves under our protection. 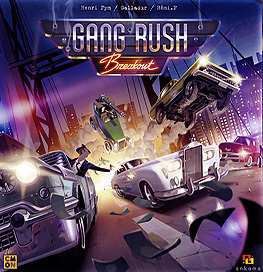 I have noticed recently that some of you have started taking it easy, so I would advise you to make an effort to be fast and efficient this time around, and not to let me down..."
Players will embody mafia henchmen, who will find themselves all simultaneously racing to make it down the home stretch to their HQ. At the wheel of customised cars, they'll have to manoeuvre, shoot, and haul on the wheel to bring back the biggest jackpot and become the Boss's right-hand man. Each one of them can, of course, advise, threaten, and "influence" the other players in their choices. In this game, it's allowed! 2 Road pieces, 4 small supports, 2 tall supports, 1 crosspiece, and 4 reinforcements to form the bridge. 60 Tiles: 30 "Hazards" and 30 "Bonmus"